Samsung in India seeks to break a Guinness World Record set in Great Britain where there were 201,948 participants in creating a digital art piece. Samsung India made the announcement today and aim to promote the Galaxy Note II. Samsung is calling on artists to be part of this cause by submitting their artwork to Samsung via their website, Facebook page, email or physical stores to be merged into one huge art piece. 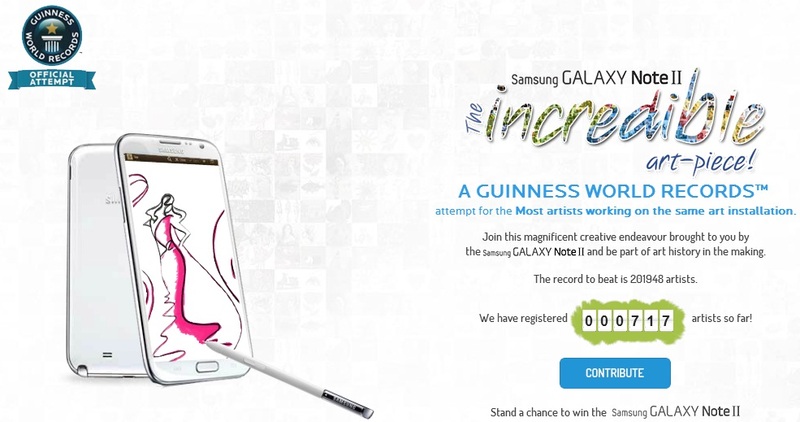 Contributors stand to win Galaxy Note II merchandise and smartphones. As of now there are 717 artists engaged and counting. Samsung has been showing how valuable the Galaxy Note II and Note 10.1 is to artists and creatives, mostly due to the upgrades S Pen SDK that is quite responsive and enables one do the work they would do on a paper using a pen. More-so the ability to convert the designs to digital copies for scaling and sharing via on-line media. Flexibility of the devices and power due to the quad core processor and 2GB RAM makes this quite easy a task.